NBC has promoted three executives and added one outside hire to its leadership team in the Alternative and Reality Group, the company announced Tuesday. Jenny Groom has been upped to lead programming and development within the group, while George Sealey will now oversee creative affairs for projects ordered into production at Universal Television Alternative Studio. 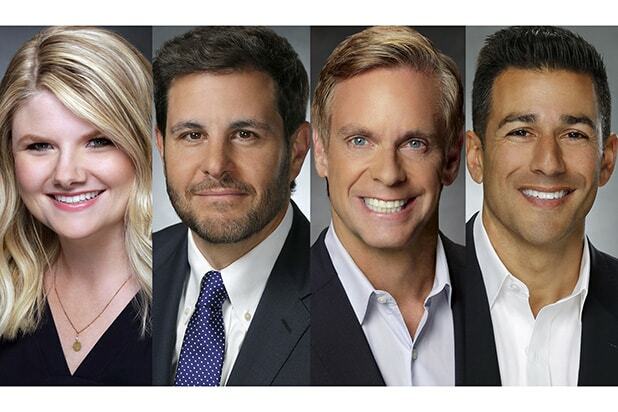 Enrique Guillen, who has been promoted to executive vice president, will continue to lead international commercial strategy, with former Electus Television president John Pollak joining NBC to fill a similar role domestically for both Universal Television Alternative Studio and the first-run syndication business. Read the full bios of the four execs below. In her new post, Groom will serve as the head of the network’s alternative department, overseeing programming strategy, development and current series. She is tasked with identifying key development areas as well as potential talent partners both behind and in front of the camera. The role encompasses all network development and production and will entail close collaboration with marketing, publicity, digital, sales and other areas of the company to help launch and maintain all series. Guillen’s elevated post will see him continue to run international commercial strategy, expanding Universal Television Alternative Studio’s content pipeline and reach. Guillen spearheaded the international expansion of the Alternative Studio at its inception, starting with the global rollout of the award-winning hit game show “The Wall,” which he also developed and launched for NBC. Under his purview, the studio’s properties “World of Dance,” “Hollywood Game Night” and “The Wall” have been sold in over 45 countries. Guillen has also led a series of innovative content initiatives with overseas networks and producers, and has overseen merchandising, licensing and digital innovation for the studio brands. In his previous post as Senior Vice President of NBC Alternative Programming, Guillen oversaw the hit primetime shows “The Celebrity Apprentice” and “Last Comic Standing,” among others. Before joining NBC Entertainment, Guillen was a founding member of Telemundo Studios, helping launch production centers in several Latin American countries and creating an original scripted content pipeline of more than 800 hours per year. Sealey will lead the team that oversees the day-to-day creative development, production and post-production for all greenlit series and pilots for Universal Television Alternative Studio, collaborating with producers and network executives on series creative, casting, budgets, post-production and series launches. In 2016, Sealey took on the role of Senior Vice President, Alternative Programming and Development and joined Ahr to help launch Universal Television Alternative Studio. Since then, he has managed and overseen the production and launch of several studio series, including “World of Dance,” “Making It,” “The Titan Games,” “Better Late Than Never,” “Hollywood Game Night,” “Songland” and several additional projects in early stages of pre-production. Sealey joined NBCUniversal in 2012 following seven years as a producer for the network, including stints as Co-Executive Producer on both “The Celebrity Apprentice” and “Fashion Star.” During his tenure as a network executive, Sealey oversaw “The Biggest Loser,” “The Celebrity Apprentice,” “Running Wild with Bear Grylls” and “Fashion Star.” Sealey joined NBC in 2012 as Vice President, Alternative Programming and Development. Pollak will oversee and manage all aspects of domestic commercial dealings for NBC Entertainment’s unscripted programming, including sales strategy and creative partnerships with buyers beyond the NBC network, the packaging of talent and brands to formats, and the rollout of owned-and-controlled properties on behalf of NBCUniversal Television Distribution. He most recently served as President of Electus Television where he oversaw the global rollout of Electus’ television ambitions, managing the development team and working closely with the CEO to market, pitch, develop and produce original ideas from the Electus banner and other domestic and international producing partners. In addition to his producing role, Pollak led Electus International, the company’s global sales and distribution arm, where he oversaw the international strategy and execution for the growing slate of programming within Electus and its content labels. This encompassed more than 4,000 hours of content to over 170 countries around the world from nearly 100 producers and broadcasters. Prior to joining Electus, Pollak was Executive Vice President and Head of Worldwide Sales for Shine International. He began his television career at Reveille, where he most recently held the position of Senior Vice President of International Distribution and Creative Affairs. Due to a key cast member’s injury, the network's “Rent” used mostly pre-taped footage from a Saturday dress rehearsal and couldn't hold a (lit or unlit) candle to Fox and NBC's previous live TV musicals among adults in the advertiser-coveted adults 18-49 demographic or in total viewers. Scroll through our gallery to see how each of broadcast TV's previous live productions ranks by Nielsen numbers since the genre's rebirth. Least-viewed is first, most-watched last. Musical: "A Christmas Story: Live"
Musical: "Jesus Christ Superstar Live!" Musical: "Sound of Music Live!" The rock opera "Hair" is set as NBC's next live TV musical and slated to air this spring, after Jennifer Lopez's "Bye Bye Birdie" -- the network's original next musical -- was delayed multiple times.